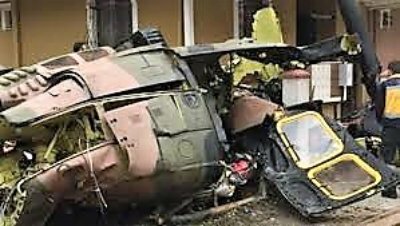 A military helicopter crashed into a residential area in Istanbul, Turkey’s largest city on Monday, the governor of Istanbul said on Twitter. The governor of Istanbul Ali Yareli Kaya said the helicopter fell in a residential building area. The picture shows the rubble of crashed helicopter in the residential area. Four soldiers onboard the helicopter died in a crash.